Take on the role of a warrior, an aspiring gladiator a deadly duellist. Prove your worth in the arena as you strive to battle out of the gutter. 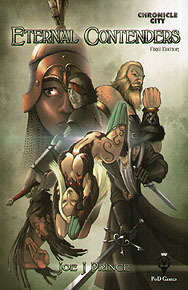 Eternal Contenders is the anticipated evolution of the award winning Contenders role-playing game. No preparation time is required to run this GM-less game. Every player character is under the spotlight as a capable protagonist. Fighter's dreams will be realised or dashed. This is our story: we, the warriors - Eternal Contenders.